As you all have probably figured out by now I have a large and ever-growing vintage fabric stash that I often rummage through, but rarely cut up and use. Actually, I guess lately I have been going for it and using some pieces here and there. 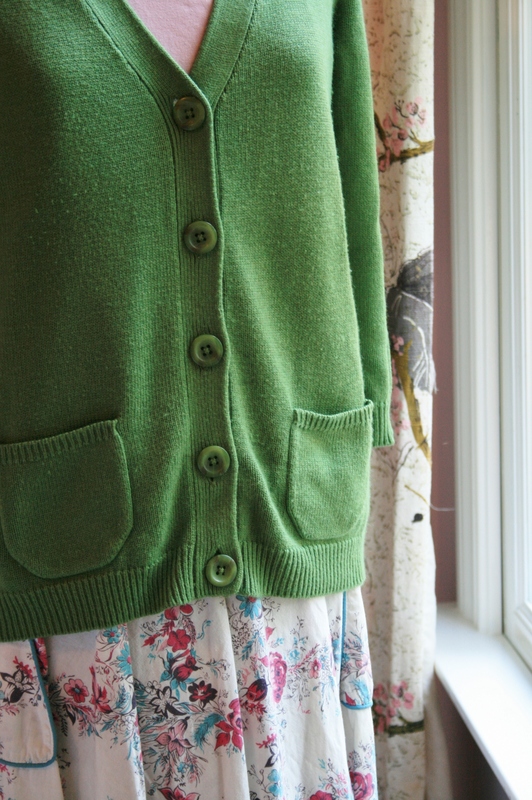 But it has taken some time for me to get here and to do so on an article of clothing. I used to love using vintage fabrics to make bags, dresses, skirts, etc., but after moving into the corporate work world, funky just did not cut it any longer. Due to my exposure to the client I felt I had to move away from anything that was not conservative and simple. Not to say I don’t like things on the simple side, give me a plain black T and jeans any day! The thing is, my wardrobe, while very nice, had become kind of boring. I still have random fun things for special occasions, but gone are the cute corduroy blazers with funky hand-painted buttons, big brash 1950’s barkcloth shoulder bags, vintage beaded Angora cardigan sweaters and fun bangle bracelets and funky rings. Me and my wardrobe are about as neutral as they come. So, part of my recent need to “wardrobe tweak” was to not only revamp my old and somewhat tattered items, but to also just breath new life into what had become a very stale closet. …Let’s face it, what really brought me to this spot was the need to rework my clothing without spending any money (or as little as possible)! 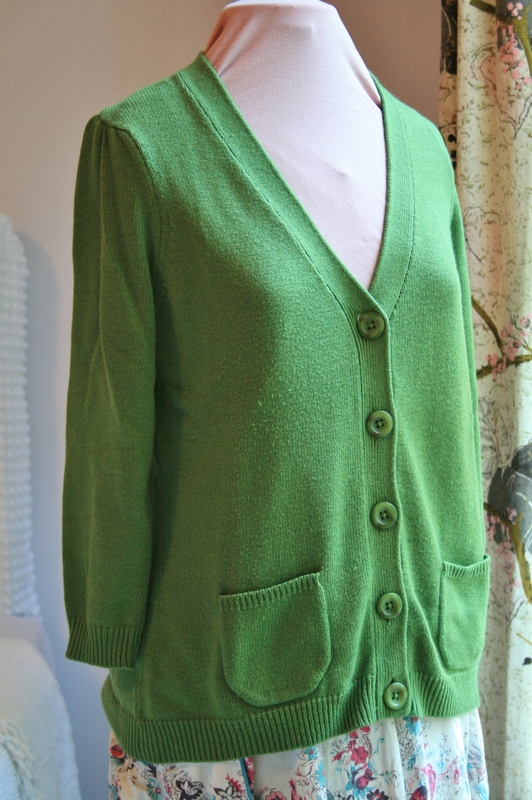 Since fall is here and winter is fast approaching, I have been concentrating on my sweaters first. I found a couple of little pieces of cotton with a sweet red, pink and dark green geometric floral pattern on a pale pink background and thought it would work for this revamp. 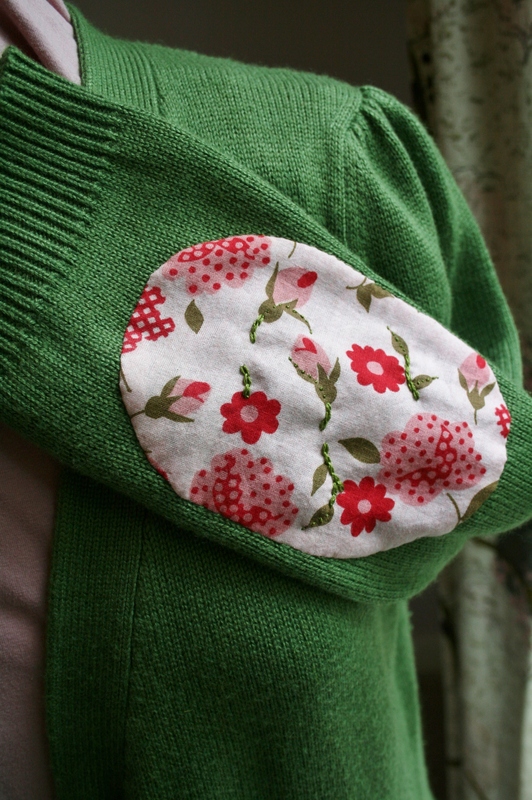 I knew I wanted to change up the pockets and I was also thinking that maybe some elbow patches were in order, but lets start with the pocket details. 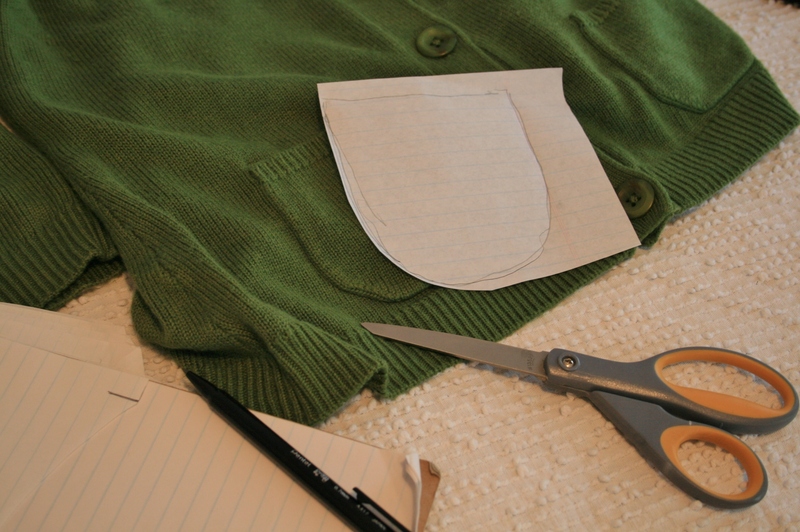 I started by just tracing the pocket outline onto a sheet of paper and cutting it out to make a template. 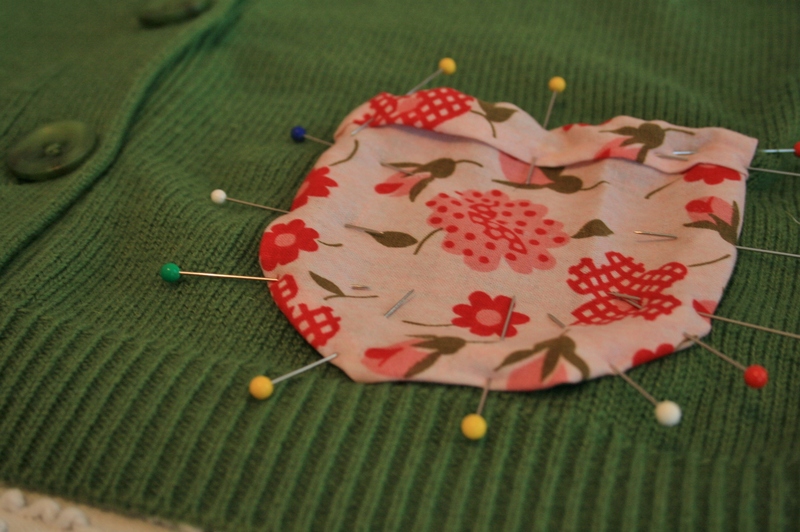 Then I used it to cut two patch pocket pieces from the vintage fabric, adding about a 1/4 inch seam allowance. Next I just pinned the fabric in place, giving it a thin fold along the top edge of the pocket just for some added detail. 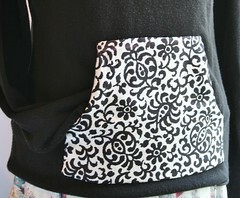 Then I hand stitched the vintage fabric in place along the outside edge of the pocket. 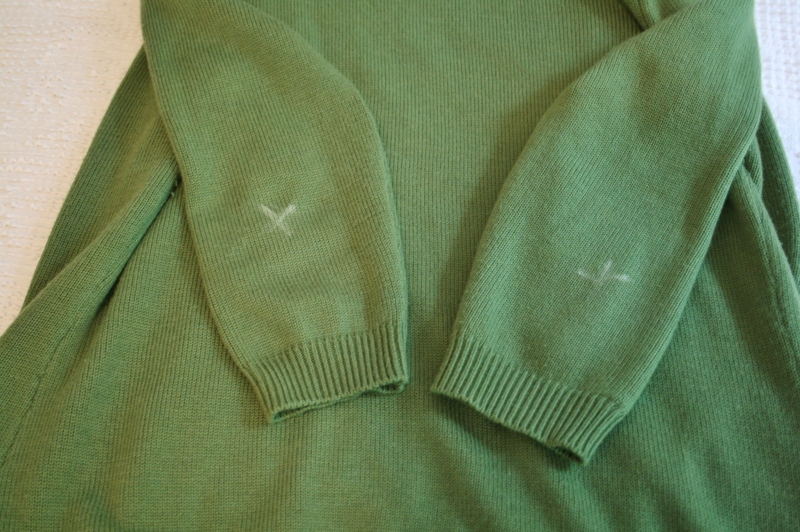 After getting to this point I knew it needed elbow patches, so I put the sweater back on and marked exactly where the point of my elbows hit the sweater (remember this is a three-quarter length sleeve, so they had to go lower than you might think). To make a pattern I just used the pocket template I had already created and folded back the straight-edged end to make a half circle. Then I traced that half circle onto another sheet of paper, cut it out and used it on the fold of the fabric so that after cutting I would have two larger ovals. 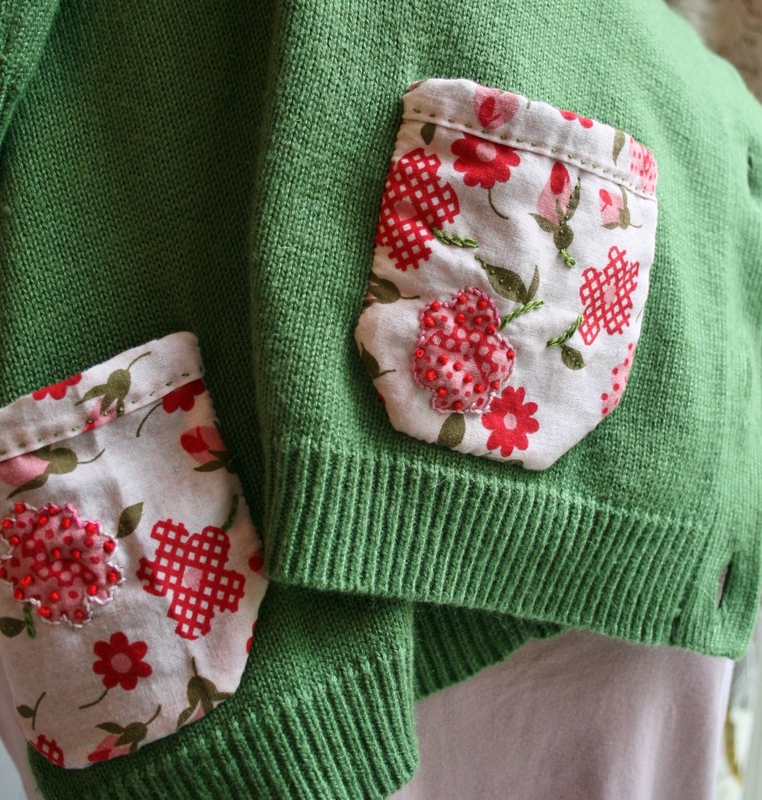 They were just right for the elbows and I used the same pinning and hand stitching process to secure them to the sweater, as I did for the pockets. 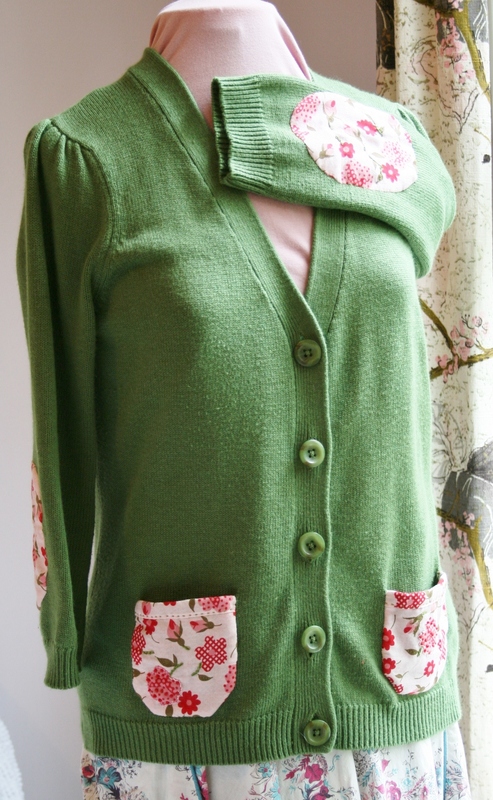 With both the pockets and the elbow patches in place it still seemed that something was missing. So, I decided to get my embroidery on! 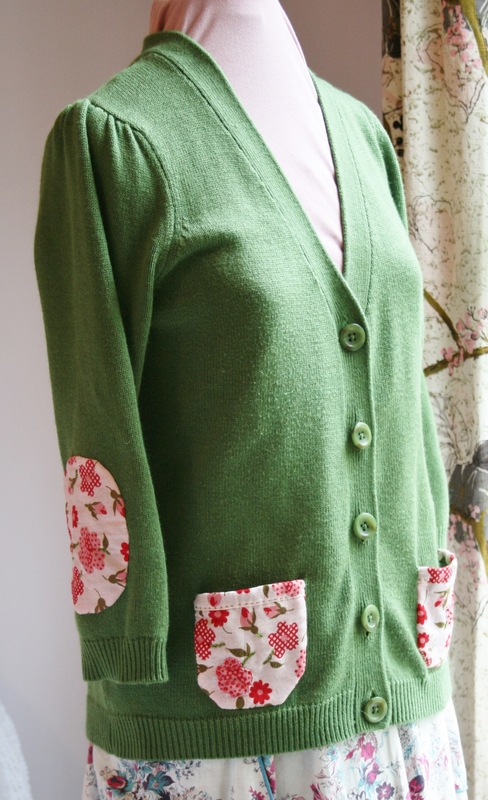 Not only did this add some dimension and texture, but it also helped to attach the vintage fabric to the sweater. 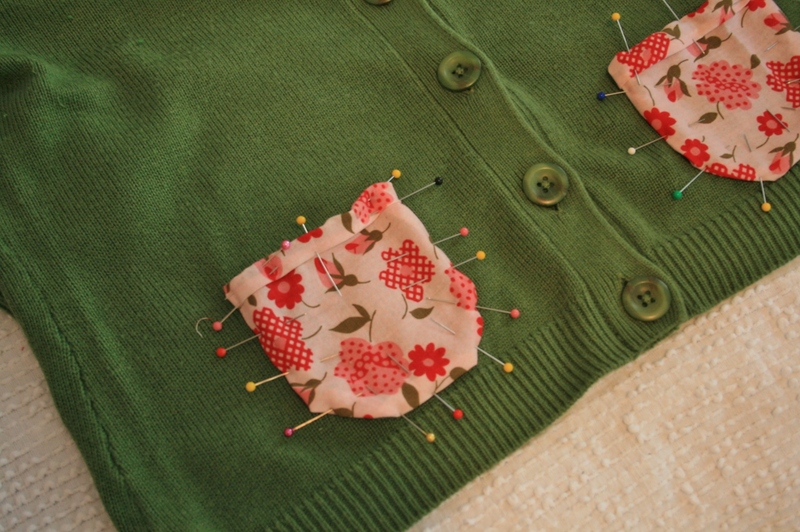 I chose not to use any kind of fusible webbing in this project because I figured it would not adhere well to the sweater material, so I wanted to go a step further to make sure the vintage fabric stayed in place as long as possible. I used a chain stitch to highlight some of the stems and large flowers, plus some french knots to make the polka-dots jump right up from the pattern. It came out a little more cutesy than I had originally planned, but… what the heck? 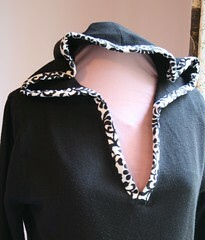 It’s still going to be fun to wear and the total cost for this tweak was well under $10.00! So, get into that closet and find something to bring back to life! If you do, please forward an email (chictweaks@yahoo.com) with pictures so I can add to our photo pages. Yeah, I thought about doing that, but I was afraid it was becoming to cutesy. Who knows, I may change my mind in the future. Thanks for the compliment!